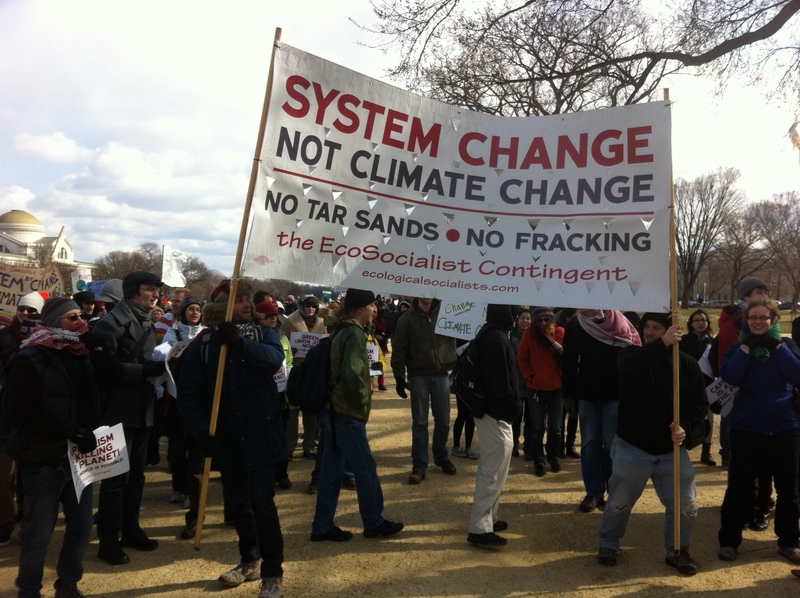 The beginnings of System Change Not Climate, marching as the Ecosocialist Contingent in Washington D.C.
What is System Change not Climate Change? What are our goals? We are, in one sentence, a bottom-up, anti-capitalist, climate justice coalition. We need more grassroots organizing infused with collective decision-making over what campaigns we take on and our strategies & tactics within those campaigns. The climate movement must begin a far-ranging discussion within society: can stopping climate change be compatible with an economic system that is flooded with fossil fuel profits? Can we create a safe and healthy planet for all human beings while simultaneously allowing ever-expanding resource extraction, endless growth, and the massive inequalities that come along with it? Students and youth have always played a vital role in social movements, but we need a more radical, anti-racist labor movement at the heart of the climate justice movement to have the social, political and economic leverage to counter the wealth and corporate power of the 1%. We want a movement that creates world that isn’t driven by profit and ruled by those that profit the most, a world driven by the needs and wants of all human beings and the planet. Read our Points of Unity for more detail. Why is it useful to build a System Change chapter in my city or town? We are a young organization, with chapters in only a handful of cities. Imagine if we had chapters across the country, with people everywhere involved in climate justice struggles, learning from each other, sending and receiving updates of where the struggles are at, coordinating actions nationally! What does a System Change chapter look like? What kind of activism can we do? This depends on what is happening around you and how big your chapter is. In New York, our biggest chapter to date, we often go to different protests and actions to meet people and build relationships. We hold weekly meetings in a democratic fashion, in which everyone has a chance to vocalize their opinions and have a say in what we do as a group. We also work with other environmental groups in the city to organize rallies, like the one for the anniversary of Hurricane Sandy. In other places, the activism that a SCNCC chapter does could be about getting a toxic waste facility out of a neighborhood, or demanding for more transport workers so the community could have more mass transit and fewer cars. Maybe the only community garden in your area is going to be shut down, or you demand for one to be opened, and take it as an opportunity to talk about how rich people, who are mostly white, never have to fight for things like this. In essence, climate justice is tied in with our day-to-day lives, and the fact that it directly impacts us, we don’t have it and have to demand it already begins to expose the problems with this system. It is struggles like these, relevant to people’s everyday lives that will help raise awareness and offer an alternative to the status quo, which is clearly dysfunctional. I’m already involved in a bunch of activism; does it make sense to start a chapter of System Change? A System Change chapter can be whatever you want it to be, as long as it is thoroughly democratic, agrees with our Points of Unity, and collaborates with other chapters and members of SCNCC whenever possible. What that looks like depends on the time you and the other members can allot to organizing, and the activism that’s out there in your community. Maybe in your community it makes more sense to be a network of activists who have political meetings or film screenings every now and then, and participate in our monthly conference calls to learn what’s happening in the rest of country, share what’s happening in your locality and participate in crafting the direction of the organization (for example: “what should our strategy be?” “what is ecosocialism?” or “what does anti-capitalism mean?”). Elsewhere, maybe it makes more sense to be more than a network, and rather function as a group of people that figure out their strategy together, initiate and/or participate in one or many fights for climate justice that are out there. Flyer to meet people: Whether it’s a pamphlet with information about capitalism and climate change (see our Resources section), a flyer for a meeting you want to organize, or a fact sheet about an issue in your community, flyering in your school, neighborhood, workplace, and most importantly at a political event can be a great next step. Find out what people think of climate justice, what issues they are invested in and what they think it will take to stop environmental destruction. If there is no one else from System Change in your city, this is a great place to start. Hold a study group on campus, in your community, or in your union / labor network: www.ClimateandCapitalism.com has a great selection of articles and books from an ecosocialist perspective (we are working on compiling a list that contains works from other anti-capitalists perspectives as well). If you are already involved in a group, or know people that would be interested in something like this it could be a great step for becoming more serious activists (did you know that members of the Black Panthers were required to read two books per WEEK?). Also, people like Chris Williams are part of our group and available to address any questions people have. Get involved in an environmental justice campaign, or start one: Find out online what environmental justice organizations exist in your community. Are any of them involved in campaigns that directly impact you or that you feel passionate about? Then get involved! It will be a great way of advancing the struggle, learning more about organizing, and meeting a bunch of people who also want to do something to change the world around them. Of those people, some, like you, are bound to have started making connections between a racist imperialist world that puts profit before people and environmental justice. If there’s nothing happening and you already have a group of people together, you start a campaign on your own! Participate in SCNCC monthly conference calls: None of us has all the answers. Our monthly organizing calls help every make sense of the world. They also help generate meeting and event ideas, as well as coordinate efforts. There’s even some debate! Organize an event: SCNCC and our affiliated groups have hosted some fantastic conferences in NYC, the Bay Area, Los Angeles, and Vancouver. But you can start small. Contact us for speakers or topic suggestions. Organize a contingent to participate in national or regional actions like Summer Heat, Power Shift, Forward on Climate Rally, or Idle No More solidarity events. Here are some recent events. Sign up for our monthly newsletter, which includes announcements of monthly organizing conference calls open to everyone interested in building SCNCC. If you’ve done any ecosocialist writing, or are inclined to, please submit articles and book reviews via our contact form. And please follow SCNCC on Facebook and Twitter. If you have any further questions or ideas, contact Michael at systemchangenotclimatechange@gmail.com. We are lucky enough to have people with different ranges of experience in System Change that offer advice on starting and sustaining chapters and campaigns. We are also working towards a speakers bureau and webinar system to have SCNCC members and allies give presentations wherever / however needed. In the meantime, you can always use our audio and video resources for educational purposes.